The goal of our expert wedding dress restoration service is to return your vintage wedding gown to the best condition possible with minimal stress to the garment. This usually involves chemical whitening of vintage wedding gowns. We have several different chemicals and processes that can accomplish this and we determine which to use by a variety of methods. We may test a small piece of the fabric to see which chemicals work best. We may make a decision based on the fabric content. We may make a decision based on the condition or age of the garment. However, despite our best efforts to restore your garment to perfection, we can run into challenges. Due to the age of some of these garments, prior treatments and the different methods they have been stored, it is impossible to predict everything that can go wrong. But after restoring many vintage wedding gowns, we have developed some experience on many fabrics and gown styles, and how they might respond to the restoration process. After we inspect your garment, if we believe it is at high risk for problems, we will notify you and you can weigh the benefits of the treatment against the risks and make the decision whether to go forward with the treatment or not. A Liability Release Form will need to be signed before we can treat a high risk garment. If you decide not to accept your garment’s proposed treatment, we will return your deposit and ship your garment back to you at no charge. If you consent to the proposed treatment, you will not pay your full balance until our expert gown care technicians are satisfied with the results. If the results are deemed unsatisfactory by our staff, we will return your garment to you without additional charges. Your only financial risk is your $100 deposit. We have listed below some common challenges in wedding gown restoration for your education and so that you may understand some common risks in vintage garment restoration. Many vintage wedding gowns can have problems with buttons. Depending on the age of your gown, it could have buttons made with wood, metal, or even paper pulp. The restoration process is a water based treatment, and many vintage buttons react adversely to water and restoration chemicals. After inspecting your gown, we will consult with you if we have recommendations for your specific buttons. Additional fees may apply for vintage button care. Some satin fabrics may respond well to the whitening agents but may lose some sheen. While yellowing and brown spots can be easily removed, the resulting ivory or off white color of the gown may not be completely consistent throughout the gown. There may be some slight color variations. The satin may have less body than it originally did. Sizing is removed during wet cleaning and chemical soaking. We may determine to add sizing back into the gown, depending on the fabric, style and goals for the gown. Rayon and/or cotton satins and brocades may shrink slightly during the whitening process. 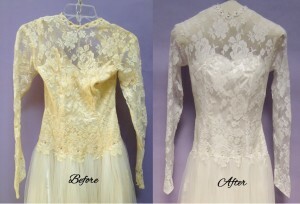 Many vintage laces can become fragile from the restoration chemicals. They may tear during processing or easily afterward. Often these tears can be repaired for an additional cost. Very old veils, from the 1950’s era often can not be cleaned at all. When submerged in water or any chemical they may disintegrate. Based on our experience, we can usually predict the viability of veil restoration. Although there is no guarantee that we will always be correct. Headpieces are usually salvageable, and new tulle can be sewn on to replace the old if needed. However, headpieces are not included in restoration costs but will incur additional costs. 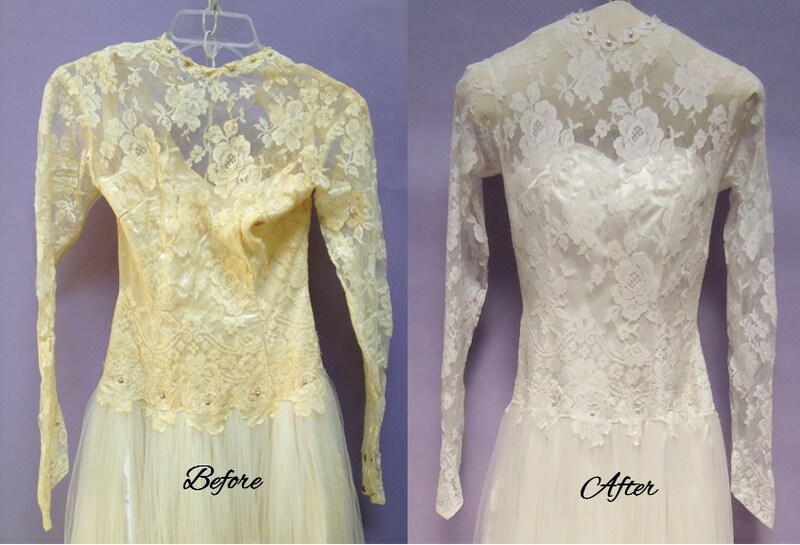 Tulle restoration is included. Some dresses are a combination of all of the above fabrics and trims, and would be subject to all of these risks. Some newer vintage fabrics (1960’s through the 80’s) respond very well to whitening chemicals, with little or no damage. Some garments that appear to be in great condition, can be damaged during cleaning or restoration due primarily to the age of the garment. The older the garment, the more risk that whitening chemicals could damage it. While it is impossible to predict every possible problem that could arise during garment restoration, please be aware that our goal is to return the garment to the best condition possible and most of our customers are thrilled with the results, as the improvement in the garment is usually very significant. Strapless gowns (or heavy gowns or gowns with thin straps) that are preserved with Museum Method™ (hanging) wedding dress preservation will have cotton twill tape straps sewn into the bodice (or waistlines) to give your wedding dress extra support and distribute the weight of the gown evenly. All gowns that are preserved have the bust cups removed. Most bust cups are made from Styrofoam which will break down and can cause damage to the wedding gown. Your bust cups will be returned with your wedding gown. Wedding gowns preserved with Museum Method™ preservation must be folded during transit. We use large boxes so that the folding is minimal. When you receive your wedding gown, please remove the bagged dress from the shipping box and hang in your closet for storage.